The Division of Astrophysics of the American Physical Society selected Research Associate Ryan Keisler as a recipient of their Early Career Recognition Award, the so-called "Young Stars Award." 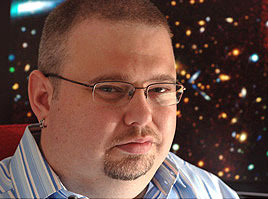 Keisler is a Hubble Fellow at the University of Chicago. His research is focused on investigating physics beyond the standard model through detailed measurements and analysis of the cosmic microwave background and the growth of structure in the universe. 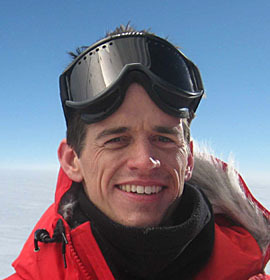 He is a key member of the South Pole Telescope project, working on all aspects of the project from developing new instrumentation, to detailed cosmological analysis of the data. In recognition of the award, Keisler will be giving an invited lecture on his work at the April 2013 APS meeting in Denver, Colorado. Congratulations to Prof. Michael Gladders! Dr. Michael Gladders promoted to Associate Professor with tenure. Congratulations Mike on this well deserved recognition of your scholarly accomplishments! Congratulations to Dr. Christopher Greer! Congratulations to Christopher Greer for successfully defending his PhD dissertation on "Calibrating Optical Richness using Sunyaev-Zel'dovich Observations." "Chris Greer made critical contributions to the building and deploying of the Sunyaev-Zel'dovich Array (SZA), an interferometric array of 3.5 meter mm-wave telescopes located at the CARMA site in California. He used the SZA to image the SZ effect for a sample of galaxy clusters selected by their richness in the SDSS maxBCG cluster catalog. His thesis provides the first joint calibration of the SZ and optical mass-observable relation. This work is important for using cluster surveys for constraining cosmology, in particular the nature of dark energy, and it provides the ground work for the upcoming joint analysis of the large South Pole Telescope and Dark Energy Survey data sets." 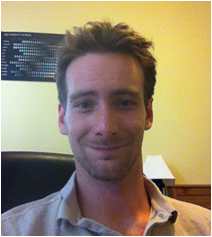 Christopher has received a postdoctoral researcher position at Steward Observatory at the University of Arizona. The MIDAS (MIcrowave Detection of Air Showers) experiment has been recently installed at the Pierre Auger Observatory in Malargue, Argentina. 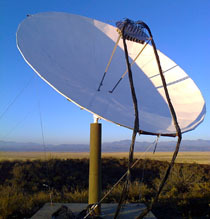 MIDAS employs a novel technique to detect ultra-high energy cosmic rays, based on microwave emission from the cosmic ray shower developing in the atmosphere. Results from a prototype telescope, which was mounted at the 4.5 meter parabolic dish on the roof of the Kersten Physics Teaching Center at the University of Chicago, have been recently published on Physical Review D. Following the successful run in Chicago, the MIDAS camera and electronics were disassembled and shipped to Argentina, where simultaneous detection of ultra-high energy cosmic rays with the Pierre Auger Observatory will be pursued. The installation was completed in three weeks, and commissioning and calibration of the telescope are undergoing. MIDAS will take data for about a year searching for events detected in coincidence with the Pierre Auger Observatory. Congratulations to Dr. Melanie Simet! Congratulations to Melanie Simet for successfully defending her PhD dissertation on "Galaxy cluster center detection methods with weak lensing." "Melanie has studied weak gravitational lensing caused by galaxy clusters. She led the effort to measure this lensing signal in Stripe 82 of the Sloan Digital Sky Survey, with results that will help calibrate cluster masses and begin the community on the road to measuring tomography. For her thesis, Melanie studied the important effect that it is difficult to locate the true center of a galaxy cluster. This "mis-ceterning" problem leads to incorrect mass determinations. By using a combination of simulations and data from SDSS, Melanie quantified both the effect and various algorithms proposed to address it." Melanie has received a postdoctoral position at the Carnegie Mellon University. Congratulations to Dr. Samuel Leitner! Congratulations to Samuel Leitner for successfully defending his PhD dissertation on "The Star Formation History of Disk Galaxies & Implications for Simulations." "In his thesis paper Sam has derived star formation histories of galaxies, which are still forming stars now, using a variety of observations on how star formation rate depends on stellar mass of galaxies as a function of cosmic epoch. Remarkably, the results show that galaxies such as our Milky Way have formed more than 80% of their stars over the last ten billion years of the evolution, and less than 20% during the first three billion years. This result is at variance with most simulations of galaxy formation and may help to explain why simulations generally fail to produce late-type disk galaxies with small bulges. In his paper, Sam has also uncovered a curious discrepancy between the star formation histories of dwarf galaxies derived using the method he used and those deduced from the color-magnitude diagram of stars for nearby dwarfs." Samuel has received a Prize Postdoctoral fellow position in the Center for Theory and Computation at the University of Maryland. Congratulations to Dr. Christopher Kelso! Congratulations to Christopher Kelso for successfully defending his PhD dissertation on "Recent Results in Dark Matter Direct Detection Experiments." "Chris' research has been focused on dark matter, and interpretations of data from a number of underground experiments designed to search for it. Particularly exciting has been his work on dark matter interpretations of the signals reported by the CoGeNT, CRESST and DAMA experiments. While we cannot say for certain yet whether these experiments are seeing dark matter particles, Chris' work has certainly helped to make these experiments and their anomalous results a "hot topic" among particle physicists and cosmologists." 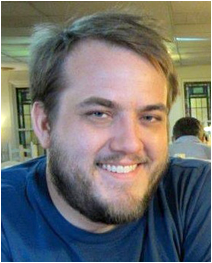 Christopher has received a postdoctoral scholar position at the University of Utah. Congratulations to Dr. Eva Wuyts! Congratulations to Eva Wuyts for successfully defending her PhD dissertation on "A Magnified View of High Redshift Star Formation." 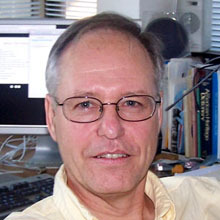 Prof. Stephan S. Meyer will share the $500,000 award of the 2012 Gruber Cosmology Prize with NASA Wilkinson Microwave Anisotropy Probe (WMAP) lead Charles Bennett and other colleagues from the team. The WMAP team used observations of the so-called "echo of the Big Bang," the Cosmic Microwave Background radiation, to determine the universe's vital statistics - its age, content, geometry, and origin. This feat in turn has helped transform cosmology itself into a precision science. 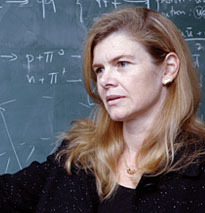 I am pleased to report that Angela Olinto has accepted appointment as Chair of the Department of Astronomy & Astrophysics for a term of three years, effective October 1, 2012. Thank you Angela! You can count on the support of us all! As part of our ongoing partnership with the School of the Art Institute of Chicago(SAIC), students in an Architecture, interior architecture and designed objects (AAIDO) studio course designed and constructed a portable exhibit about the South Pole Telescope. This installation pays homage to the 100 years of exploration and discovery at the South Pole and to the most recent scientific achievements of SPT. Visual imagery provides a glimpse into life and research at the Amundsen-Scott South Pole Station. 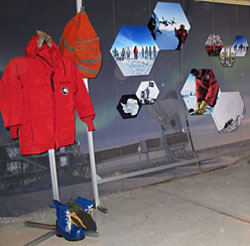 Interactive components include a backdrop of the ceremonial South Pole and Extreme Cold Weather (ECW) gear photo op and a multi-touch table that encourages self-guided exploration of images, videos and data. The first destination for the exhibit is the USA Science and Engineering Festival in Washington DC (April 27-29)where Tom Plagge, Tyler Natoli and Kyle Story will represent the SPT science team. Other planned deployments include The World Science Festival Street Fair and special events at SAIC. 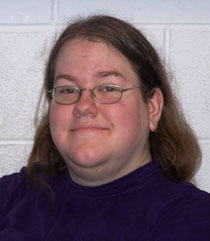 Congratulations to Prof. J. Bean! 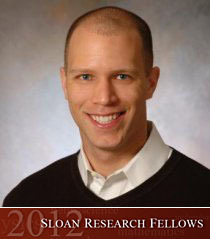 Please join me in congratulating Jacob Bean, who was selected as a 2012 Alfred P. Sloan Research Fellow! Please join us Thursday at 3pm in the TAAC Cosmic Soup Kitchen to celebrate!